Composer Stephen Lias is passionate about the National Parks of the United States. He has served as artist-in-residence at several Parks and has written eighteen works inspired by them. Following his 2009 River Runner for trombone and piano—inspired by Big Bend National Park in Texas—Sequoia for trombone choir pays tribute to the colossal trees at California’s Sequoia National Park. 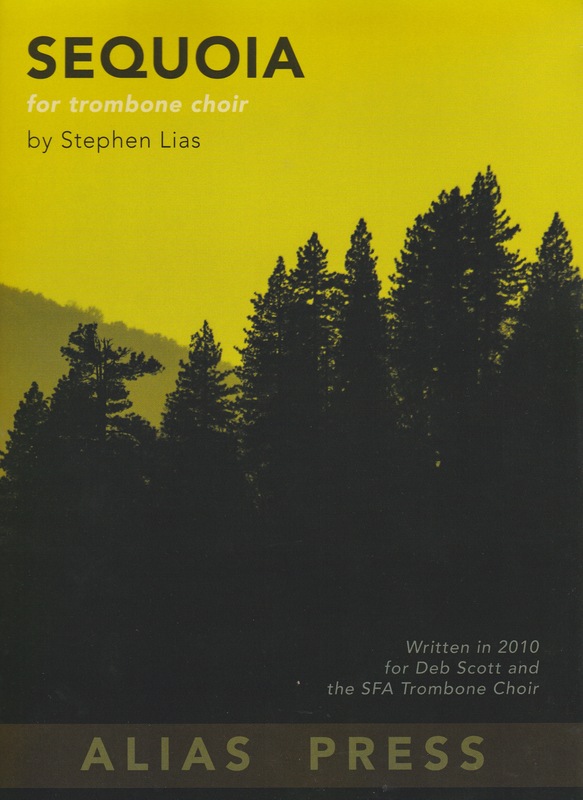 Sequoia was composed for Professor Deb Scott and the Stephen F. Austin State University (Texas) trombone choir; it is scored for six tenor and two bass trombones. Lias has chosen a fanfare motif as the operating theme of the piece. Its tempo, Mysteriously, fits the mood and character of the great trees. Sequoia begins softly before ending with a majestic triple fortissimo. Cup and Harmon mutes lend their voices to the work’s evocative character and range demands are not excessive, with bass trombone 2 descending to GG and tenor trombone 1 to a1. Sequoia will serve as a fine opening work on a trombone ensemble concert: short, interesting, and celebratory. Recommended.